The kibbutz movement is one of the things that made Israel so unique in its younger days and, while the movement has changed quite a lot in the last few decades, it is still a huge draw for people from all over the world and fairly unique within the world. The first kibbutz was established long before the State of Israel. The idea was a kind of socialistic community where everyone had equal rights and opportunities. For many years children slept in dormitories with other children and were cared for by a members of the kibbutz, almost all meals were eaten in a communal dining hall and there was often just a small store for essential purchases, but no cash would change hands, the money was deducted from your pay at the end of a month. Today things are slightly different. For a start, children usually live with their parents and teenagers sometimes have the option to move out into teen apartments. Not everyone who lives on a kibbutz will be expected to work there, but quite often all salaries are paid directly to the kibbutz. Furthermore, communal meals are less common and many members will prepare their meals at home. However, kibbutz members will receive the same budget (based upon their family size) regardless of their job or position and all children are given the same educational opportunities. Kibbutzim are general governed by system of direct participatory democracy and this means that individuals really can make a difference to the day-to-day running of the kibbutz. Most kibbutzim will have a particular industry that they specialise in to make money for the community. This may be an area of farming or something entirely different such as furniture making. The vast majority of people who live on the kibbutz will work for the kibbutz’s industry and this is what makes up the day-to-day life of its members. Kibbutzim in Israel come in all shapes and sizes. Some are as small as just 100 people while others number over 1,000. At present there are around 250 kibbutzim in Israel with a total population of about 125,000. The vast majority of them are secular but there are about twenty religious kibbutzim. Not everyone can just move to a kibbutz, you need to be accepted as a member first. However, there are plenty of volunteer opportunities on kibbutzim and these can often lead to an invitation to join the community. While you are on your gap year with Aardvark you will have the opportunity to see a few different kibbutzim and experience first-hand what life is like for residents. 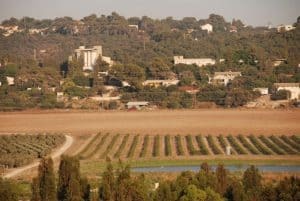 While you will only spend a few days living as a kibbutznik, it is a great experience and one that you will look back upon for years to come. Of course, there is always the chance that you’ll decide that life on a kibbutz is the way forward and you could find yourself coming back for more.